Thanks for agreeing to be interviewed. Could you please share your name and where in the country you are from? Would you mind sharing the moment that your life changed forever? Erin was 19 months when she was finally diagnosed with ddh or hip dysplasia. I suspected the diagnosis as we had seen a paediatrician just a day earlier and he suggested that outcome before sending us for an x-ray to have it confirmed. The peadiatrician rang me the following day with a positive diagnosis. How dd you react to that diagnosis? The diagnosis was a shock as no one else in the family has ever had ddh that we are aware of and Erin was my third baby. Therefore she didn’t fit the typical markers. However, we have since realised that ddh is strongly linked to hypermobility syndrome which I had as a teen and all three of my children have since been diagnosed with to differing severity. And how did that impact you and the people around you? 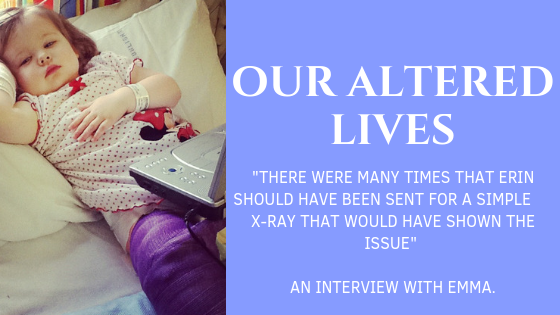 The impact was far-reaching as we were told that Erin would need to undergo multiple surgeries and spend several months in a cast that went from belly to ankles on both legs. She would be immobile from the ages of 2-3. I decided to take a sabbatical for a year to be at home with Erin but it impacted on all the family as we were frequently in hospital and we could not get about easily. 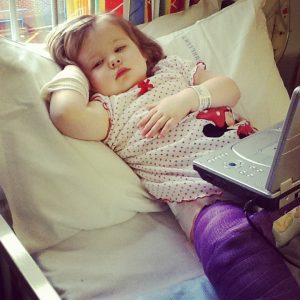 Erin’s first operation failed despite spending 18 weeks in a spica cast. She therefore required more invasive surgery to reshape her hip socket. Wow that must have been tough! Do you remember any specific dark or brilliant moments on your journey? Getting to the point of diagnosis was hard as I had been fobbed off so many times and I was very angry that a dislocated hip was not identified until she was over 18month old. Baby checks failed Erin and there were many times that she should have been sent for a simple x-ray that would have shown the issue. One macabre moment came after one of her surgeries, we had been in the hospital for 5 days and Erin was on morphine which gave her an upset stomach. On the Sunday morning after discharge Erin had a poo explosion, it was literally seeping over the top of the cast and dripping out of her ankles. We tried in vain to clean her before realising we couldn’t and I took her to A&E where they didn’t know what to do either until we got hold of her consultant who had just flown abroad on holiday! Erin had to get back to theatre the following morning because of the risk of infection in her wounds. I was terrified that it would happen again but fortunately, it didn’t! 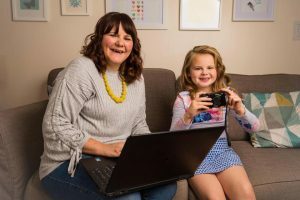 On the positives, I loved being at home more and focussing on my blog and this, in turn, led me to leave teaching altogether a few years later. What have you done to work your way through it all? I am active with a support charity and have run a half marathon to raise funds for other families. I have also written about our experiences to help educate others. One highlight was being asked to present some training on DDH to midwives and health visitors about our journey. I hope they have gone on to understand more about ddh and spot the signs sooner. Early detection means many can be fixed by wearing a harness with no surgery required. We never got that chance. Do you ever think about the life you had planned for before Erin’s diagnosis? I was much more career orientated with aspirations to be a senior leader, I was a middle leader at the time. I left it all! However, it gave me the chance to explore writing and a career I had been talked out of when I was at school. I was told that being a writer was not a job and encouraged to teach instead! How have you changed as a result of your experience? I am much more patient but I am more vocal! Nobody could fob me off now if I thought something was wrong with my kids! I stand up for things more and push until I get what I want! If you met someone going through the same thing as you now, what advice would you give to them? I would say DDH is not life threatening but it is life changing as Erin will now live with this condition for life. She is likely to need a hip replacement at some point but we don’t let it define her. She dances, she runs (not very fast or very well, but she does it). Arm yourself with knowledge too as I wanted to understand her surgeries and be able to question her specialists. Now I know as much as them! Finally, never underestimate the impact a medical condition can have, the biggest way to rub me up the wrong way, for example, would be to suggest that Erin is fixed now or that they also know someone that had a clicky hip and just had to wear a double nappy. Until you have walked in someone else’s shoes don’t assume anything. Thanks so much for sharing your story, Emma. I hope it’s exactly what someone somewhere needs to read to help them avoid Erin’s struggles which you all cope so brilliantly with.